The Northeast Ohio Coalition for the Homeless is beginning our 2016 campaign to include homeless people in voter registration and get out the vote campaigns. We have a staff person, Ken Payton, who is assigned to work on voting activities. He can pick up your completed registrations and get them over to the Board of Elections in a timely manner. He will be coordinating rides to the polling place in October and November and can bring your agency blank registration forms if you need. We are hoping that each agency can assign one person to work on voting activities since every homeless person needs to update the Board of Elections on their residency for voting purposes. 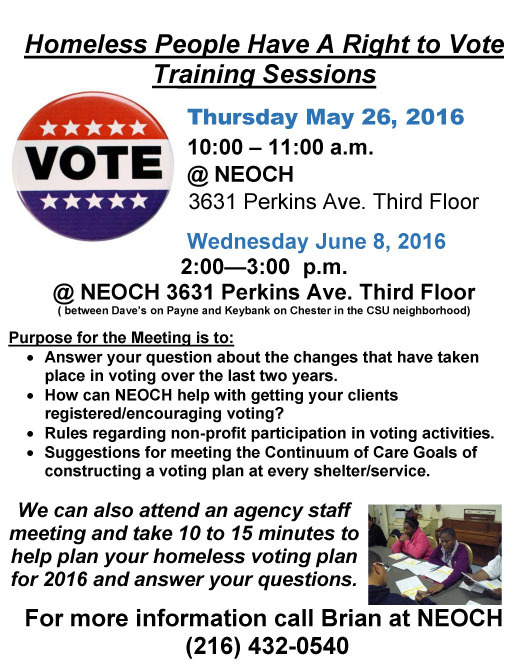 In 2016, we are offering to come to your staff meetings to talk about homeless participation in voting if you want.